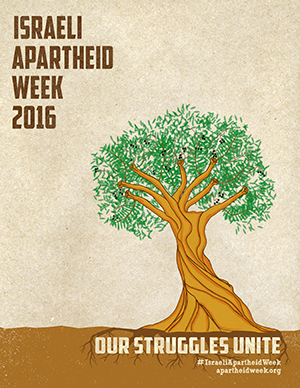 Each year, Israeli Apartheid Week takes place across more than 150 universities and cities. It aims to raise awareness about Israel’s ongoing settler-colonial project and apartheid policies over the Palestinian people. Panels, film screenings, and creative actions build support for the Palestinian-led Boycott, Divestment and Sanctions (BDS) movement. Please join us in making the the 12th Israeli Apartheid Week one of the biggest yet. Find out about Israeli Apartheid Week 2016 events and actions in your area by selecting your city on the map below or by following us on Facebook or Twitter. Israeli Apartheid Week is organised by an international network of grassroots solidarity groups, unions and activists. Organising IAW events on your campus or in your city is easy. Register now to receive an info pack full of ideas and inspiration and to be able to promote your events on this website. Israeli Apartheid Week is an annual series of university lectures and rallies against the Israeli occupation of the West Bank and Gaza. The series is held in February or March. According to the organization, “the aim of IAW is to educate people about the nature of Israel as an apartheid system and to build Boycott, Divestment and Sanctions (BDS) campaigns as part of a growing global BDS movement.” Since IAW began in Toronto in 2005, it has since spread to at least 55 cities around the world including locations in Australia, Austria, Brazil, Botswana, Canada, France, Germany, India, Italy, Japan, Jordan, South Korea, Malaysia, Mexico, Norway, Palestine, South Africa, the United Kingdom, and the United States. The organizers said the week has “played an important role in raising awareness and disseminating information about Zionism, the Palestinian liberation struggle and its similarities with the indigenous sovereignty struggle in North America and the South African anti-Apartheid movement.” An international divestment campaign was also said to have gained momentum in response to the 2005 statement by over 170 Palestinian civil society organizations who called for boycotts, divestments and sanctions. They also claimed that important gains had been made in the campaign in countries like South Africa, the United Kingdom, Canada and the United States. Cities to have hosted a previous event of the Week are, amongst others: Oxford University (Oxford), New York City, University of Toronto and University of Ottawa, Canada; Montreal, Hamilton, London, Cambridge and Soweto, South Africa. In 2009, locations included Abu Dis, Berkeley, Boston College, Emory University, Bir Zeit, Edinburgh, Edmonton, Johannesburg, Oxford, Kalkilya, San Francisco, Soweto, Tulkarm and Washington, D.C. In 2010, locations include Jerusalem, Amsterdam, Bard (NY), Beirut, Berkeley, Bethlehem, Bil’in, Bogota, Bologna, Boston, Cape Town, Caracas, Chicago, Connecticut, Duluth, Dundee, Durban, Eastern Cape, Edinburgh, Edmonton, Gaza, Glasgow, Guelph, Hamilton, Houston, Ireland, Jenin, Johannesburg, Kingston, London (ON), London (UK), Madrid, Melbourne, Minneapolis/St.Paul, Montréal, Nablus, New York City, Nil’in, Ottawa, Oxford, Peterborough, Pisa, Pretoria, Providence, Puebla, Roma, San Francisco, Seattle, Sudbury, Tilburg, Toronto, Truro (CA), Utrecht, Vancouver, Waterloo and Winnipeg. In 2014, locations include Vienna, Brussels, Ghent, Botswana, Cuiaba, Porto Alegre, São Paulo, Calgary, Edmonton, Hamilton, London, Montreal, Ottawa, Peterborough, Regina, Sudbury, Toronto, Vancouver, Waterloo, Winnipeg, Copenhagen, Helsinki, Joensuu, Bordeaux, Grenoble, Lille, Lyon, Marseille, Metz, Nantes, Paris, Strasbourg, Tours, Berlin, Freiberg, Stuttgart, Dehli, Cork, Dublin, Galway, Bologna, Cagliari, Rome, Venice, Japan, Amman, Irbid, Seoul, Kuwait, Lebanon, Malaysia, Morocco, Oslo, Jerusalem, Bethlehem, Gaza, Nablus, Naqab, Ramallah, Tulkarem, Yaffa (Jaffa), Aliwal North, Benoni, Cape Town, Durban, Fleurhof, Grahamstown, Johannesburg, Laudium, Mitchells Plain, Orange Farm, Pietermaritzburg, Polokwane, Port Elizabeth, Port Shepstone, Pretoria, Roshnee, Rustenburg, Soweto, Stellenbosch, Barcelona, Gijon, Irunea, Madrid, Palma, Sevilla, Valencia, Malmo, Stockholm, Basel, Berne, Geneva, Syria, Golan Heights, Bangkok, Birmingham, Bradford, Cambridge, Dundee, Durham, Edinburgh, Essex, Exeter, Glasgow, Kent, Lancaster, Leeds, Liverpool, Manchester, Northampton, Nottingham, Oxford, Sheffield, Southampton, Sussex, London, Albuquerque, Arizona, Beaumont, Boston, Cambridge, Chicago, Dearborn, Delaware, Louisville, Maryland, Massachusetts, Milwaukee, Minnesota, New Jersey, New York, Ohio, Olympia, Omaha, Philadelphia, Seattle, Toledo, Washington DC. The first Israeli Apartheid week was held Jan 31 to February 4, 2005. The 2006 Israeli Apartheid week was held February 13 to 17, 2006. The 2007 Israeli Apartheid week was held February 12 to 17, 2007. The 4th Annual Israeli Apartheid Week 2008 was officially launched on February 3, 2008 in Soweto, South Africa as the “exiled Palestinian Israeli Knesset” Azmi Bishara, gave a lecture on the 60th anniversary of the Palestinian Nakba. The conference continued till the 19th of the same month. The week of the event was February 4 to February 9, 2008. The 2009 Israeli Apartheid Week was held March 1 to 8, 2009. The 2010 Israeli Apartheid Week was held March 1 to 6, 2010. The 2014 Israeli Apartheid Week was held Feb 24 to March 28 in over 50 cities around the world. In 2012, the Palestine Society of the London School of Economics (LSE) erected a mock “Israeli Apartheid Wall,” which led to a confrontation after Pro-Israel students threw waterballoons at the mock wall in protest. In 2013, Harvard University’s Palestine Solidarity Committee, which organizes Israeli Apartheid Week at Harvard University, posted mock eviction notices on students’ dorm room doors. American scholar and MIT professor Noam Chomsky has spoken various times at many university campuses as part of Israeli Apartheid Week. Ben White, a freelance journalist and author of two books on the Israeli-Palestinian Conflict, has also been active speaker during Israeli Apartheid Week both in the United States and the United Kingdom including his alma mater Cambridge. Israeli historian and Exeter professor Ilan Pappé has also spoken at Israeli Apartheid Week events throughout the UK. Israeli historian and Oxford professor Avi Shlaim has given speeches at Israeli Apartheid Week, including one at the London School of Economics. Israeli Apartheid Week events are almost always hosted by solidarity societies and organizations associated with academic institutions. Speakers at the various meetings around the world support the goals of the Week. An Arab citizen of Israel and Member of the Knesset, Jamal Zahalka, spoke in Montréal in 2007. He said: “Calling the occupation apartheid isn’t an overstatement, it’s an understatement. The Israeli occupation in the West Bank and the Gaza Strip are worse than apartheid. Pro-Palestine mural on a graffiti wall at the University of the Witwatersrand, Johannesburg. The State of Palestine, also known simply as Palestine, is a partially recognized state in the Middle East. Its independence was declared on 15 November 1988 by the Palestine Liberation Organization (PLO) in Algiers as a government-in-exile. The State of Palestine claims the West Bank and Gaza Strip, with East Jerusalem as the designated capital, while actually exercising partial control of those areas assumed in 1994 via the Palestinian Authority. Most of the areas claimed by the State of Palestine have been occupied by Israel since 1967 in the aftermath of the Six-Day War. The Palestinian Authority applied for United Nations (UN) membership in 2011 and in 2012 was granted a non-member observer state status – which amounts to a de facto, or implicit, recognition of statehood. As of 14 September 2015, 136 (70.5%) of the 193 member states of the United Nations and two non-member states have recognised the State of Palestine. Many of the countries that do not recognise the State of Palestine nevertheless recognise the PLO as the “representative of the Palestinian people”. On 29 November 2012, the UN General Assembly passed a motion changing Palestine’s “entity” status to “non-member observer state” by a vote of 138 to 9, with 41 abstentions.